UN ESPECTÁCULO MUSICAL DIVERTIDÍSIMO, TAN APROPIADO PARA EXTERIORES COMO PARA SALAS DE TEATRO, EN EL QUE SE MEZCLA EL HUMOR, CANCIONES ORIGINALES CREADAS ESPECIFICAMENTE PARA ESTE ESPECTÁCULO, CUENTOS CON TÍTERES Y TODA LA MAGIA DE ESPÍRITUS DE SAL TEATRO. TRES ACTORES PROPONEN A LOS NIÑOS PASAR UNA BONITA VELADA CANTANDO Y CONTANDO CUENTOS. EL MAESTRO DE CEREMONIAS MIKI Y SUS AMIGOS HARAN PARTICIPAR A LOS NIÑOS, CANTANDO CON ELLOS EN DIRECTO. LULÚ Y KIKI CANTARAN Y CONTARÁN EN VERSO LA HISTORIA DEL PIRATA DESAFINADO, Y EL CUENTO DEL CONEJO MAROMERO, QUE QUERÍA IR A LA ESCUELA, Y ADEMÁS TEATRALIZARÁN EL CUENTO DE PITAGORÍN, EL RATÓN DE BIBLIOTECA QUE SE COMIA LOS LIBROS EN VEZ DE LEERLOS. CANCIONES Y JUEGOS HACEN ESTE MUSICAL DIVERTIDÍSIMO PARA TODAS LAS EDADES. 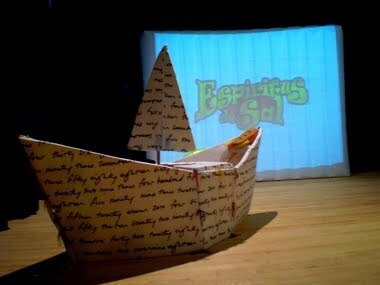 View more documents from ESPÍRITUS DE SAL PRODUCCIONES TEATRALES S.L..